The client’s design goal for the project was to create a sophisticated and contemporary ultra lounge environment, enhanced through the use of state-of-the-art video, sound and LED lighting technology. It was equally important for the design to allow for the space to transform from day to night for a myriad of occasions. A space that functions as a restaurant, lounge, nightclub and live performance venue. Stylish, contemporary, and state-of-the-art, Spin Ultra Lounge is the ultimate night-life destination in Boca Raton, Florida, USA. The Moroccan-themed space mimics a colonnade, with raised bars and columns around the perimeter of the venue and a dance floor and stage in the middle. Serving as a restaurant, lounge, nightclub, live performance venue, and casual happy hour spot, Spin Ultra Lounge needs to change its look and feel at the touch of a button. The key ingredient in the lounge’s flexibility is its LED lighting system, which can instantly change the ambiance of the entire space — from day to night, from a warmly lit restaurant to a colorful concert backdrop to a vibrant night club. The design team for the project consisted of a diverse group of individuals. Lionel Ohayon of ICRAVE led the lighting design efforts and worked with Joe Zamore from LED Source® to specify the best LED solutions for the project, while Angelo Poulos from Advanced Audio Technology brought in his expertise for the audio piece. Howard Werner of Lightswitch then integrated both the lighting and audio components through his programming efforts. To achieve a truly immersive lighting experience, the design team first created a three-dimensional media wall that wrapped around the perimeter of the space. The walls are fitted with LCD monitors and overlaid with hexagonal lattice sculptures derived from a vintage Moroccan pattern. Philips Color Kinetics iColor Cove MX Powercore LED grazing fixtures line the top and bottom of each wall, transforming them into dynamic, color-changing surfaces. The digitally controlled LED lighting coordinates with the LCD screens and with projectors lighting the lattice sculptures, creating a multi-dimensional and vibrant atmosphere. To light the lounge’s stylish entrance, the team installed 2700K wide beam eW Cove MX Powercore LED fixtures. In addition, 2700K eW Fuse EC Powercore fixtures uplight and downlight the etched glass wall in the entry. The designers used additional Cove fixtures throughout the club. iColor Cove MX Powercore fixtures illuminate the ceiling coves and the dance floor, while 2700K eW Cove Powercore fixtures accent the undersides of the bar counters. ColorBurst 6 fixtures in ceiling pockets spotlight unique Moroccan accent pieces throughout the venue. LED Source® chose Philips Color Kinetics LED lighting fixtures for the project because of their high-quality color mixing and because they require minimal maintenance, allowing the original design and focus to stay intact years after the design team leaves the building. 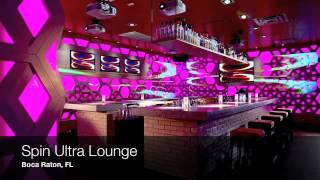 LED lighting takes Spin Ultra Lounge to the next level of entertainment — the lighting fixtures are incorporated seamlessly into a media-rich digital system of light, video, and sound to provide a truly immersive experience. The digitally controlled system gives the venue the ability to change its look and feel at the touch of a button, setting the tone for any occasion.